Today I have a card for The Flower Challenge. This is a monthly challenge where we get a new theme around the first of each month. 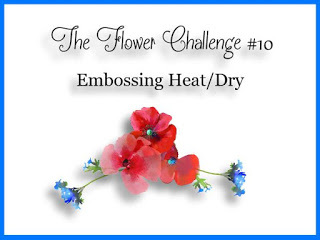 This month's theme is Heat and/or Dry Embossing. This card surprised me a little bit because I thought I would never use this cardstock color called Melon Berry from Papertrey Ink. When I was pulling this card together for the challenge, I wanted to use Kraft Cardstock and Berry Sorbet was just too bright! This color, Melon Berry, is a bit "dusty" to me but on a whim, I decided to see how it looked and I really loved it. These images were stamped in Berry Sorbet, Melon Berry and the leaves were double stamped in Soft Stone. I had stamped some of these bouquets a few weeks ago when I was creating for the Monthly Blog Hop at Papertrey Ink. The outlines are all heat embossed in Simon Says Stamp Antique Gold Embossing Powder on the floral sprays, so when you are creating one, you might as well do a few while you have everything out and ready to go and all lined up in your Misti Tool. That way if I want or need to pull a card together quickly, I have them ready to go. If you've been to my blog before, you know that I often have Parts & Pieces of things that are extras. With this particular floral spray, I often put them in the stamp pocket with the stamp set so I will remember to use them. I love the look of Heat Embossing and it always lends an elegant touch to my projects so I had to learn pretty early on in my card making to get clean embossing. I have tried the EK Success Powder Tool and an Embossing Buddy but I didn't have much success with either. The brush on the EK Success Tool isn't great when it's new, but the bristles break easily so pretty soon I didn't have much of a brush on my tip. The Embossing Buddy is filled with a very chalk like substance and I hate the feel of it. On a whim, I tried using Baby Powder with a fluffy paint brush and I've been using it ever since. I keep a bit of the powder in an empty embossing powder container and just put a bit from the larger container in once in a while. It also smells nice so that is another plus. I do A LOT of heat embossing and using a powder tool of some kind is my most recommended tool for this technique. I'm fortunate that I have a desk and a large table in my studio so I'm not having to get my heat embossing stuff in and out. It's always out at my table and I have my heat tool sitting on a stool next to that area. I have a Ken Oliver Craft Mat underneath it just for the extra protection. I previously used a Darice Heat Tool but I invested in Wagner 650° Heat Tool after talking to my friend, Yana, when we were both at CHA earlier this year. I wanted to make sure it was worth the extra money, and having used both she said it was. I had been watching it for a while on Amazon and when it went to $28 and change, I grabbed one. I have been very happy with the performance, especially since I do so much heat embossing. As my husband would say, "You need the proper tool to do the job". It's kind of the same thing with bone folders. Once you have the Teflon Bone Folder, you would never use an old style unless your Teflon one was missing but I had to think long and hard about spending the money for it. I have some larger containers for my 7 most used Embossing Powders which include Simon Says Stamp Antique Gold (my favorite), Ranger Gold Tinsel, WOW! Metallic Platinum Sparkle, Hero Arts White, Hero Arts Satin Pearl, Simon Says Stamp Clear, and Judikins Iridescent Sparkle. For the Antique Gold, I buy a couple of containers every time Simon has it on sale because I use so much of it. If you've stuck with me this long, Thanks! I used two of the floral sprays for this card and finished it off with some Nuvo Glitter Drops in Golden Sunset. I've only used this color one other time but they were the perfect finishing touch. The nice thing is that it would be nearly impossible to create drops of all the same size but it was easy to vary the size of each drop on the card front. Thank you so much for stopping by today for this very word-y post! You can connect with me by following my blog, and there are links to Facebook and Instagram in the right hand side bar. I do my best to provide you with great information and I hope you'll come back soon. Thank you so much for making my day by leaving an encouraging comment! It means the world to me when you do. Hugs!